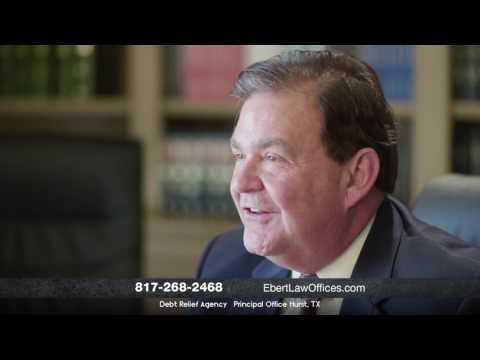 Experienced Ft Worth Bankruptcy Lawyers | Ebert Law Offices - 50+ years of experience bringing relief to small businesses, families and individuals. Don't let bankruptcy define you. Call today for a FREE consultation. Ebert Law Offices, P.C. is a family firm that has been practicing law in the Fort Worth area since 1969. Our attorneys at the Ebert Law Offices are national leaders in the area of bankruptcy law with the knowledge and experience to help you with your financial problems right here in Fort Worth. We’re delightfully small and simple, but impressively experienced and established. We’re skilled at helping you get rid of the debt that plagues you, while helping you keep the things that matter most. Bankruptcy may be uncharted territory for you, but it’s what we do everyday, with over 50 years of combined experience. Your time is valuable, just like ours. So we’ll sit down with you for a quick, “no strings” conversation to determine your best options, and of course it’s free. BBA, Texas Tech University, 1982. JD, Southern Methodist University School of Law, 1994. Licensed to practice before the United States Supreme Court, 2010.